Hanging wallpaper is a great way to fill your room with visual interest and appeal. If done right, it also requires less effort than painting your walls. 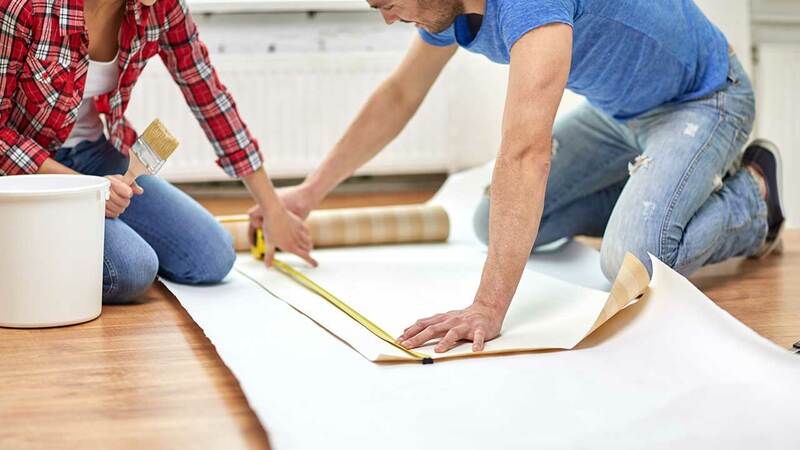 If you want to know more about the more common questions associated with a wallpaper project, keep reading as we look at the top 5 home wallpaper questions and answers. Can You Put Wallpaper on Drywall? When applying wallpaper to drywall, the key to success is proper drywall preparation. This is because any drywall flaws will become apparent when it’s covered with wallpaper. Instead of preparing your drywall with a regular primer. Use a product that combines primer and sealer, such as Benjamin Moore’s Fresh Start, so that it will protect the drywall from the wallpaper’s adhesive. A primer/sealer will also slow down drying so you will have more time to adjust your wallpaper strips to perfection. Do You Need to Prime Walls Before Wallpapering? Applying primer to your walls is necessary to ensure that your walls have the optimal surface for your wallpaper. Priming makes the entire wallpapering process much easier in that it enables sizing and wallpaper strip adjustment. It is also important to remember that you will eventually want to replace your wallpaper or paint your walls. If you prime your walls, the removal process will be much easier after a few years. Is it Cheaper to Paint or Wallpaper a Room? This is a difficult question to answer off the cuff since both paints and wallpaper products are available in varying levels of price and quality. Generally speaking, however, paint is more affordable as a short-term solution, but wallpaper typically lasts longer than paint. This means that if you want to save money over the course of, say, 10 years, wallpaper would be the cheaper option. Before choosing between paint or wallpaper, you may want to do some research to make sure that the wall covering meets your needs. If you have pets or children, for example, you will need a covering option that it easier to keep clean. Can You Put New Wallpaper Over Old Wallpaper? You can, but no industry expert recommends doing this. When you wallpaper over wallpaper, the new wallpaper can weaken the adhesive of the original paper. After a while, the entire covering may start to peel or come off. Before applying new wallpaper, a better solution is to remove the old wallpaper by soaking it with warm water or a hot vinegar solution. This will make the removal the old paper and application of the new ones much easier. You will also be able to apply the newer paper more effectively when you do so directly to the wall itself. Can You Hang Wallpaper on a Textured Wall? You can, but the texture will show through your new wallpaper. Luckily, there is an easy and inexpensive way to smooth your wall over before applying the wallpaper and that is with skim-coating. This is a spray-on joint compound that you can simply flatten with a taping knife.